Is xylitol bad for dogs? Sugar free gum a dog killer, really? Vet approved! Xylitol is a natural sugar-free artificial sweetener, which is considered safe for humans but it’s definitely not safe for dogs. Xylitol toxicity in dogs can even be life-threatening. Many people also commonly use Xylitol as a sugar substitute for their coffee or tea. Note that this list is not conclusive; there are hundreds of products containing xylitol! Therefore make a habit of reading the labels before you feed anything not specifically made for pets to your dog! Dogs are notorious for putting everything in their mouth and this also applies to chewing gum. So the responsibility is on you to keep the gum away from dogs at home and on the street! When you go on outdoor excursions, make sure towatch out for your dog chewing some off the street. It is also a good idea to educate your kids about that. And if your dog has bad breath, it is best to refer the problem to your veterinarian; a chewing gum is NOT a solution! Note: Dogs and sugar are also a bad combination! It’s not as life threatening as xylitol; but if consumed regularly, it can lead to other serious medical conditions like diabetes, dental issues and obesity. Although xylitol is a sugar-free molecule, it can still stimulate the pancreas to release insulin. Once the insulin is released, it causes a profound drop in the blood sugar levels- also known as hypoglycemia. The brain does require sugar to function. There is also evidence indicating that xylitol can induce liver failure in dogs, but the mechanism is not well understood. The content of xylitol in products does vary depending on the brand but even small amounts of xylitol are toxic to dogs. A rule of thumb: The smaller the dog, the higher the risk of toxicity. So far, it appears that all species of dogs can develop toxicity to xylitol and that there is no safe level of xylitol for dogs. What symptoms to watch out for? What to do if your dog has ingested xylitol? In every case of poisoning, time is very precious, and if you suspect that your dog consumed Xylitol, then you must get the dog to the nearest vet. The sooner you get there, the better the prognosis. If possible, bring the food item that the dog ate so you can show it to your vet. How is the diagnosis of xylitol toxicity made? In some cases, there may not be time to do initial tests and the vet may just empirically give the dog intravenous sugar based upon the history you provide. If the dog is brought in soon after ingesting xylitol, the vet may administer activated charcoal or try to induce vomiting. There are some agents that can be administered to prevent the damaging effects of xylitol on the liver. Once the dog is stabilized, the vet will perform blood and urine work to look at levels of blood sugar. In addition, because of the risk of bleeding, the vet will look at the bleeding parameters and function of the liver. Since there is no antidote to xylitol, the treatment is symptomatic and supportive; this means providing the dog with fluids, intravenous sugar, oxygen and supportive care. The dog’s blood pressure, heart rate and breathing will be closely monitored. Most dogs require a stay with the vet for 1-3 days depending on the severity of poisoning. Once the dog is stable and able to tolerate fluids, he or she will be discharged home. Recovery after xylitol poisoning is slow. You should allow the dog to rest and encourage your pet to drink fluids. No strenuous exercises should be done for 2-3 weeks. Monitor the dog’s mental alertness, behavior, weight, and general wellbeing. How to prevent xylitol poisoning in dogs? 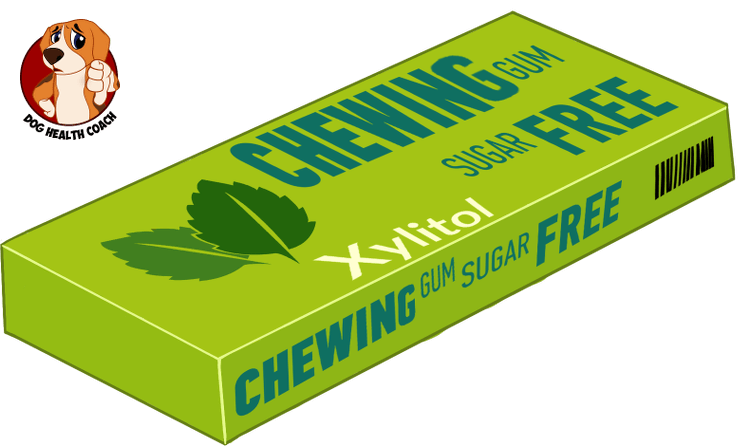 Xylitol is found in many products besides sugar-free chewing gums; the key is to store these foods away from the reach of dogs. Everyone in the household, including children, should be educated about xylitol. Dogs should not be given chewing gum or any other food that contains this agent. The only way to avoid xylitol toxicity is awareness. As your dog can pick up (sugar free) gums on the street you want to have an eye on that, too. How can we make this article more useful? Please share your thoughts in the comments. Almond milk with vanilla flavor is not good at for your puppy, sadly found this out the hard way. I thought my puppy was going to die on me from it.. I thought it would be good for him because I read that they can have almond milk , but they cant have vanilla flavored almond milk .. instantly almost he became affected, so sick I was terrified. I will never again allow him anything that I don’t research because something so simple could kill your beloved pet in a flash.. so warning to all please always know what is in the items you feed your pets so they don’t suffer ..